4-H’ers across the nation are responding to challenges every day in their communities and their world. With an expansive network reaching every corner of the country, 4-H is the nation’s largest youth development organization. More than 6 million 4-H youth in urban neighborhoods, suburban schoolyards and rural farming communities stand out among their peers: building revolutionary opportunities and implementing community-wide change at an early age. With 540,000 volunteers, 3,500 professionals, and more than 60 million alumni, the 4-H movement supports young people from elementary school through high school with programs designed to shape future leaders and innovators. Fueled by research-driven programming, 4-H'ers engage in hands-on learning activities in the areas of science, citizenship and healthy living. The caring support of adult volunteers and mentors inspires young people in 4-H to work collaboratively, take the lead on their own projects and set and achieve goals with confidence. 4-H’ers chart their own course, explore important issues and define their place in the world. 4-H’ers stand up for themselves and their communities. Enrollment begins now and ends October 15th! Explore this site to learn more! Or call the local 4H office 530-621-5503 to be connected to local volunteers to become more informed. If you miss this class then you can take it online at www.yqca.org for a $12 per person fee for that course. Any questions please contact your project leader. 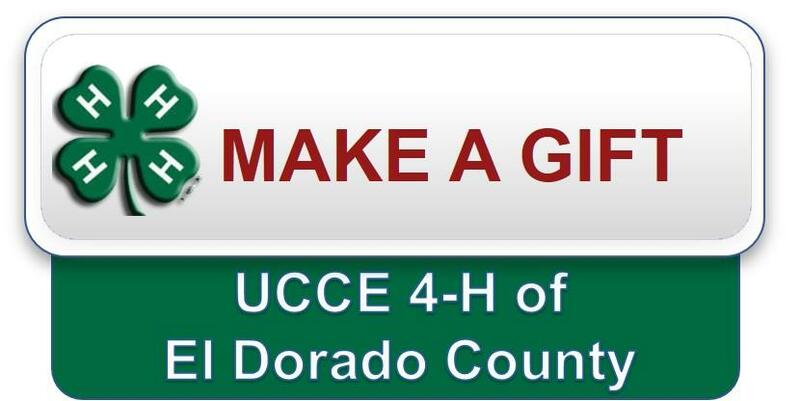 Click on the button above to make a gift to the UCCE 4-H of El Dorado Co.